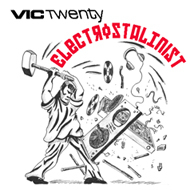 Electrostalinist is the long awaited debut album by Vic Twenty, featuring a whole host of infectious pop songs that even the best anti-biotics cannot resist! Vic Twenty has a vision of a pre-digital electronic-pop universe where shiny optimism and cynicism collide to create brilliant analogue pop without a flicker of post-modern irony. As a synthesizer 'Time Lord' with a host of assistants, Vic Twenty takes us on a journey through an electronic galaxy filled with songs that sparkle with hooks, well crafted melodies and cleverly observed lyrics displaying a keen eye for the zeitgeist. Be transported from the bitter (Dim Star) to the sweet (I Kissed A Girl) featuring Anne Mari Davies of The Trembling Blue Stars). Put on your best high heels, for the electro-fetish duel of 'Benny Hill's Not Alive Today ' featuring Anne Marie Gilkes of Erasure and later relax in the subliminally gothic lounge to the accompaniment of 'Close to You' featuring Piney Gir. Be whisked from darkness (Why Do I Want You) to bright synth pop light (8-Bit Hit). Join your synthesizer comrade in arms, as wheels of steel are smelted down for the war on modern day culture! Album released 1st September 2005 via T-Square Records. Produced and engineered by Don Tempi.